There’s Salmon…and then there’s Salmon! Fortunately we have found perfection. It’s wild organic New Zealand Salmon at Woodstock Meat & Fish Market in our town. It’s so special, my words wouldn’t properly describe it. Only to say it literally melts in your mouth with every bite. Of course a very light cooking time contributes to the creamy taste. Simply four minutes on one side, one minute on the other. Almost Sashimi, but not quite. The bed of braised vegetables in wine completed the delicious experience. Wow! 1. Heat the EVOO in large sauté pan until hot but not smoking. Add the Garlic and Chile and cook until the Garlic gives off its aroma, 2-3 minutes. 2. Add the Fennel, Lemon Peel, Thyme and Wine to the pan. Stir well to combine. Bring to a simmer and cover pan. After 15 minutes, add the Artichoke Hearts. Cook, stirring occasionally, in total for about 25 minutes, or until the vegetables are meltingly tender. 3. When the vegetables are done, transfer them to a bowl using a slotted spoon. Raise the flame high under the liquid and reduce by half. Pour the liquid over the fennel, season with Salt and Pepper, and reserve until the Salmon is cooked. 1. Season the Salmon Fillets with Salt & Pepper. Heat the EVOO and Butter in a large non-stick pan, until hot but not smoking. 2. Place Fillets, skin side down, in the pan. Cook for about 4 minutes on the first side. Turn and continue to cook for about 1 minute. 3. 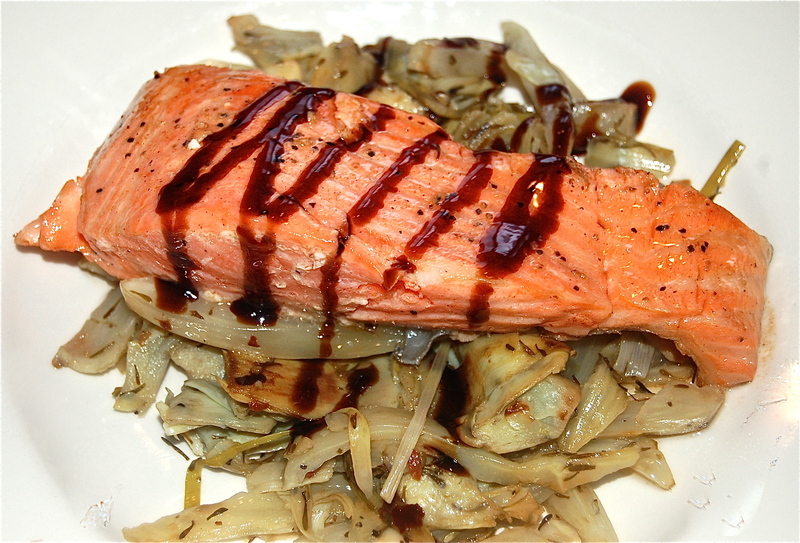 Place a bed of the Fennel and Artichokes on a plate and place the Salmon on top. Spoon extra liquid over the Salmon. Serve immediately.